Donate using your cellphone load. Donations will be charged to your postpaid bill or prepaid load. Donate using GCASH. Donations will be charged to your GCASH wallet. Donate using Smart Money. Donations will be charged to your Smart Money account. 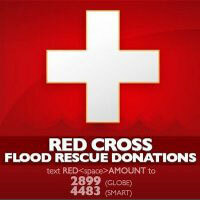 For other ways to donate, visit Philippine Red Cross.